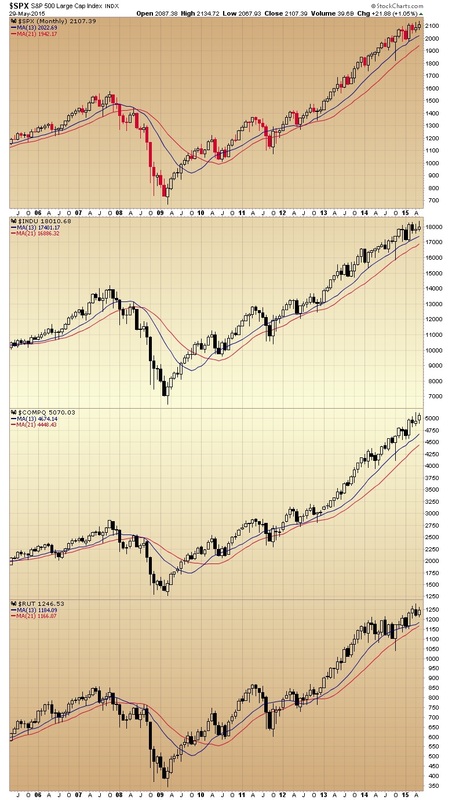 Let’s take a look at the major indices on multiple timeframes starting with the monthly view. These charts are, for the most part, picture perfect examples of uptrending markets, with the 13 period moving averages tracking higher and above the 21 period averages. 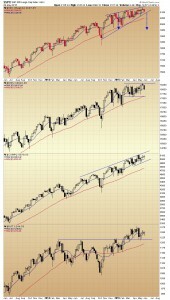 One small issue on the S&P 500 and DJIA charts is the high wick candles that formed in April and May. They represent an inability to hold the new highs. Looking back over time and putting this action in perspective, however, they don’t appear that serious. 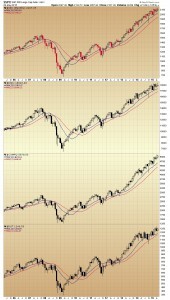 The weekly charts bring a little more detail to the technical picture. A rising triangle pattern may be forming on the S&P chart, as range contracts between converging support and resistance lines. These types of triangles usually resolve to the downside and in the case of the S&P index, the pattern projects a target in the 1950 area. 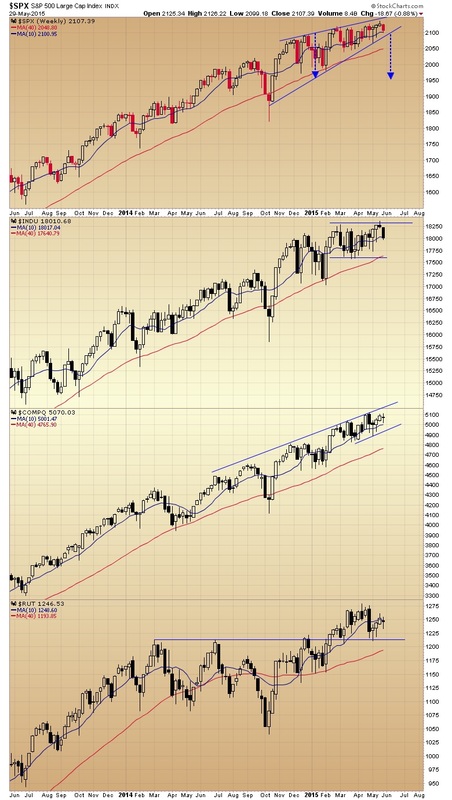 The DOW bumped up against its March high last week and pulled back this week, and the NAZ which has lagged the previous two indices a bit recently, formed a doji star, or narrow opening and closing range candle this week, a sign of indecision. In 2014, the Russell consolidated below the 1212 area, then broke above that resistance in February of this year and continued higher into April. It pulled back to test resistance-turned-support last month and, so far, the bounce off that level has failed to advance past the 10 week (50 day moving average) moving average. Focusing in on the daily S&P chart, a bearish eveningstar reversal pattern appeared over the last three sessions (I outlined the implications of the pattern yesterday), within the confines the more defined rising triangle. 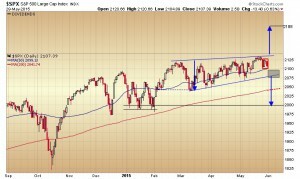 Any continued weakness likely penetrates the 50 day average and then could retest the pattern uptrend line. If, and this is getting ahead of the action, there was a serious breach of triangle support, the pattern projects through the 200 day average, back to this year’s lows. On the other hand, a breakout projects to the 2188 area. The long, intermediate and short term trends remain higher, but, as you can see, if you search hard enough there are small fissures in the bedrock. The beauty part is these minor fault lines define clear areas of support, and should alert us to any serious seismic disturbance.